Our visual systems are pretty impressive. Even when we are looking at images on a flat surface, our brains use all sorts of cues to create a 3D mental map. Shading on round objects helps, and of course the differences between what your right and left eyes see. If it’s moving, foreground objects will move faster than far field, and they’ll be larger (motion parallax). Shapes change as they rotate, and our brains interpret that easily. Occlusion, when an object passes behind another, is a big cue. Babies stop laughing at peek-a-boo when they figure that one out. I’ve been spending a lot of time with my stereoscopic computer monitor, looking at flow in the right heart. It’s so complicated that even when I use lots of shading and occlusion, twisting and turning the representation, I still need the stereo cues to really see what’s going on. But it’s thrilling when I do. So now I want to show it to everybody, but nobody else I know uses the 3D technology, even though it’s now dirt cheap (Thank you gamers!). So we’re back to motion parallax, shading and occlusion: it needs to move. The flow also needs to be simpler, so in this video, I’ve removed all the small velocities and vorticities, edited out almost all left heart and other extraneous flows, and tried to keep the colors from being overwhelming (although I love saturated colors). Please enjoy this intro ride through the right heart. I hope to have more soon. Here’s the image I was trying to get before New Year’s. This shows flow entering the right atrium of a normal subject’s heart. Blood flow is shown by the white pencils. Vorticity (the amount of spin of a bit of fluid) is shown by the colored arrows. Only the strongest velocity and vorticity is shown here, to keep the image from getting too cluttered. The right atrium is shown in transparent white, and the right ventricle is the big triangular shape in yellow. 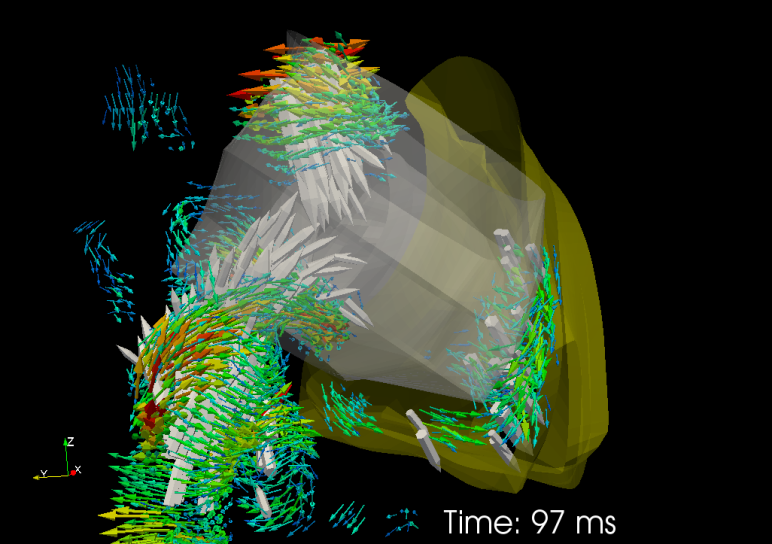 Flow is entering the atrium from the top, through the superior vena cava (SVC). You can see vorticity ringing the flow, since it is being generated at the SVC surface. Flow up from the bottom, through the inferior vena cava (IVC), is more complicated. Venous (return) flow from the liver comes in and wraps around behind the main IVC flow from the lower abdomen. The two flows mix as they enter through the bottom of the atrium. This is useful, since you want all the important chemicals from your liver to mix with the rest of your blood before it gets pumped to your lungs and beyond. Too bad this type of imaging (4DMRI) can’t give more details about the mixing process.